Rob Taylor is a California native, now living in Toronto. He has been spiritually active for over fifty years and has participated in and examined nearly every major religion and spiritual methodology. Rob is also a Marine Corps veteran and former law enforcement officer. Rob’s writings reflect his life experiences, observations, and inner evolution. He shares them as a modern perspective on spirituality and human behavior that draws on his years of spiritual study. Rob has visited or lived among numerous countries and cultures including the US, Canada, Mexico, Japan, the Philippines, England, Scotland, the Netherlands, France, Israel, Belize, and South Africa. Rob maintains a disciplined vegan lifestyle and an intense physical training regimen. Northern Moons: And the Hunt for an Artisan Quark is a collection of poetry penned by author Rob Taylor. Written with a compassionate and spiritual ideal, the poems focus on the ideas of growth, energy and love as a means of a human attaining the spiritual. As such, the collection features fifty new poems by Taylor to continue his poetic journey, surpassing the imposition of global constraints such as politics and religion, and instead focusing on a more pure journey of the soul. The poems combat the emotional journey of people through loss and fear but also hope. 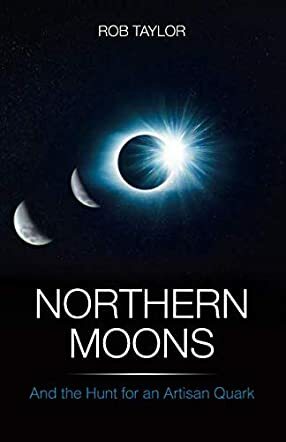 Constructed with thoughtful rhythms, careful phrasing and a varied use of complex and philosophical language, Northern Moons: And the Hunt for an Artisan Quark will not be a casual read for poetry fans, but it is certainly an important and thought provoking journey. For those more interested in the innate human condition away from the modernity of society, the works collected here by author Rob Taylor are certain to cause some emotive and creative thoughts and sensations in the hearts of his readers. These are certainly works which you can go back and read again and again in different lights, and with different emotional reflections on what it means to access the spiritual and have true compassion, love and kindness for your fellow humans. Overall, Rob Taylor has a way with the construction of fine words which is both intellectually challenging and emotionally rewarding, and I’d highly recommend Northern Moons for those looking for a powerful poetic experience. The author has a way with words and I enjoyed reading this collection. We do have control over our own destinies, but many people don't realize this and are content to be dragged along by the people around them. Rob Taylor has written some poignant poetry in Northern Moons And the Hunt for an Artisan Quark. Given the state of the world and the current political climate, it is clear that the author is aware of the greater social issues that we face and this has affected him deeply. I think that this book will strike a chord with a lot of people and that it will do well on the market. With many people looking to learn more about spirituality and return to our core state rather than being stuck in the hamster wheel of today's world, I believe that this book will speak to them and hopefully encourage them to make changes in their lives for the better. Northern Moons: And the Hunt for an Artisan Quark by Rob Taylor is a collection of poems pertaining to humanity in general that rests on a foundation of spirituality. The book starts off with an introduction by Rob describing what this book is about and also what inspired it to a certain extent. The increasing scale of destruction in general around the world and children being caught in this cross-fire along with adults is something that Rob particularly wants to draw attention to. The poems themselves express these issues of global wars, conflicts stemming from artificial, man-made concepts and ideas of nationality, religion, politics, etc. that constantly pit human beings against one another. The poetry in this book tries to counteract this violence and intolerance in the world by trying to bring to notice that we are one human family at the end of the day, and that ultimately it is spirituality and a sense that we are all fundamentally one that is going to bind us together and make for a better world. I really liked reading Northern Moons: And the Hunt for an Artisan Quark and felt that the inspiration behind this poetry is noteworthy. We are sorely in need of some spiritual truths and the quest for the ultimate truth is a human being’s real destiny. The poems in this book express Rob’s ideas about the world on a bedrock of spirituality which I really liked. The poems themselves are fairly short and some of my favorite ones are Youth, Primordial, Lifeless, Past Futures, Mortals, Earth, Trees. The poems overall have a simple clarity to them and I enjoyed the meaning behind the words expressed in only a few verses. Overall, this is a great book for poetry fans.